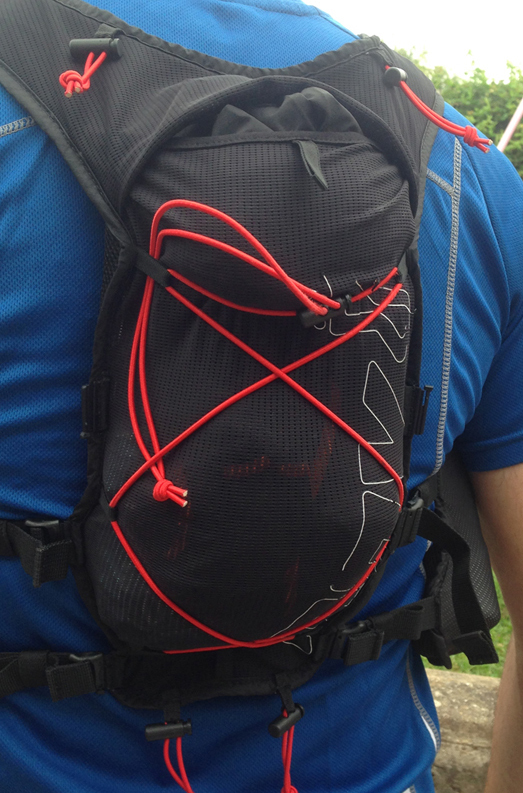 Judging from peoples kit at Ultra races, 2013 (and maybe 2012) seemed to be the year of the Salomon Slab Pack and 2014 is starting to feel like the year of the Inov8 Race Ultra Vest (although I’ve also seen quite a few of the Ultimate Direction packs around). 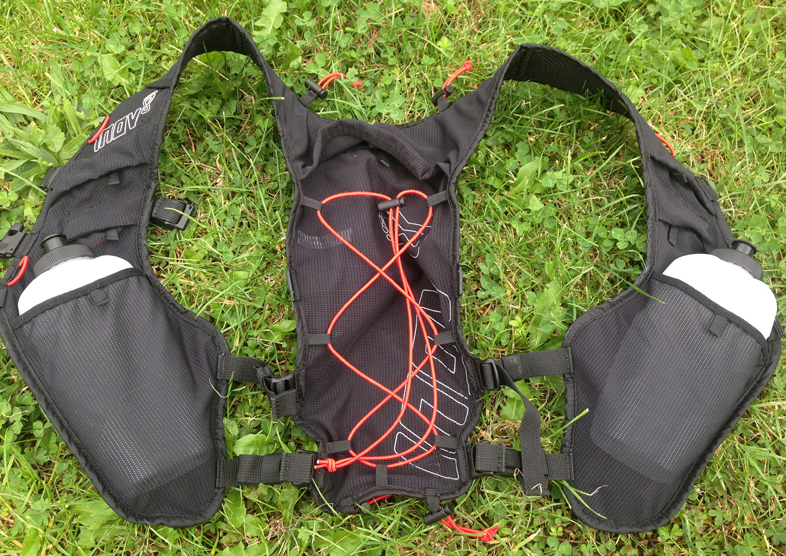 I purchased the Race Ultra vest mainly primarily for use during ‘smaller’ Ultra’s as the vest only had a 3.5L capacity. 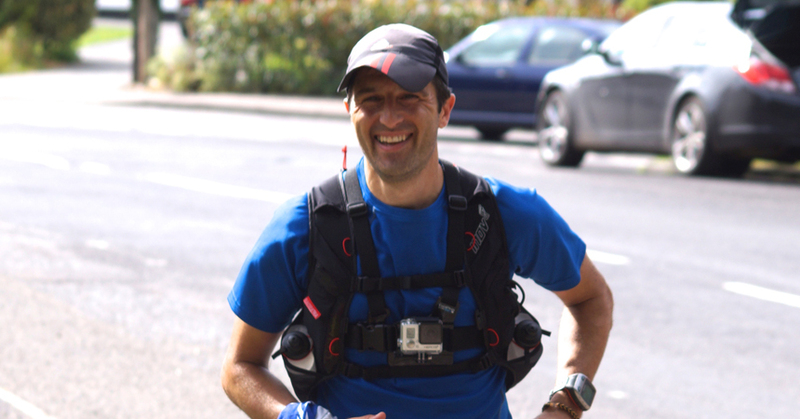 However, I found that I could carry all of the mandatory gear for a typical 100 miler and have used it during long training runs and during the North Downs Way 100. 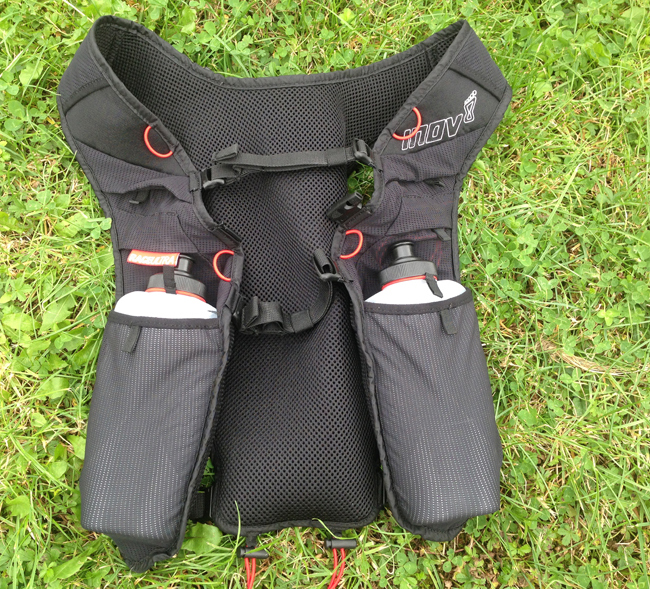 The vest is made from a stretch mesh material and is designed for water bottles (2 x 500ml are supplied) and a 2L bladder (supplied). The bottles are designed to be flatter than a typical rounded bottle to allow these to sit closer to the body and there is a small cord which can be looped over the top of the bottles to keep them in place. 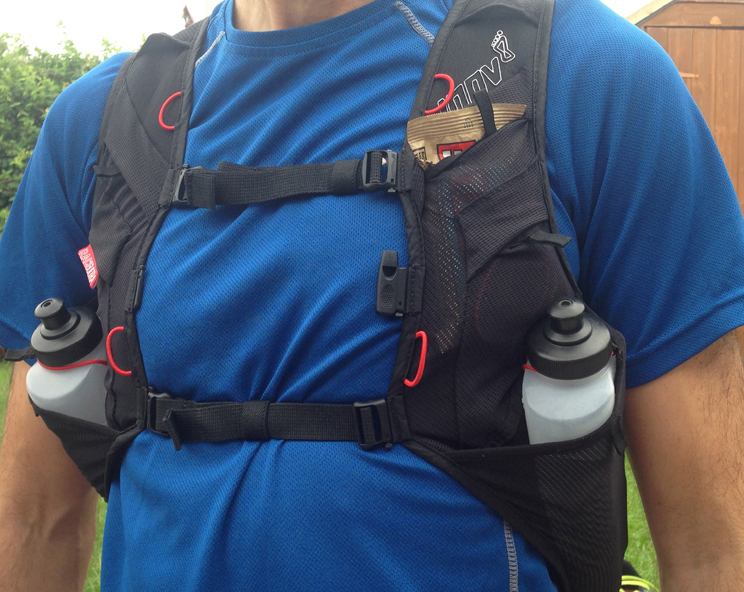 The vest has a large stretch mesh pocket in the rear for your gear such as maps, waterproofs; two large mesh pockets in the front which carry your bottles; 2 medium sized mesh pockets on the front (phone sized) and finally 2 smaller mesh pockets on the front (can fit gel/small snack). 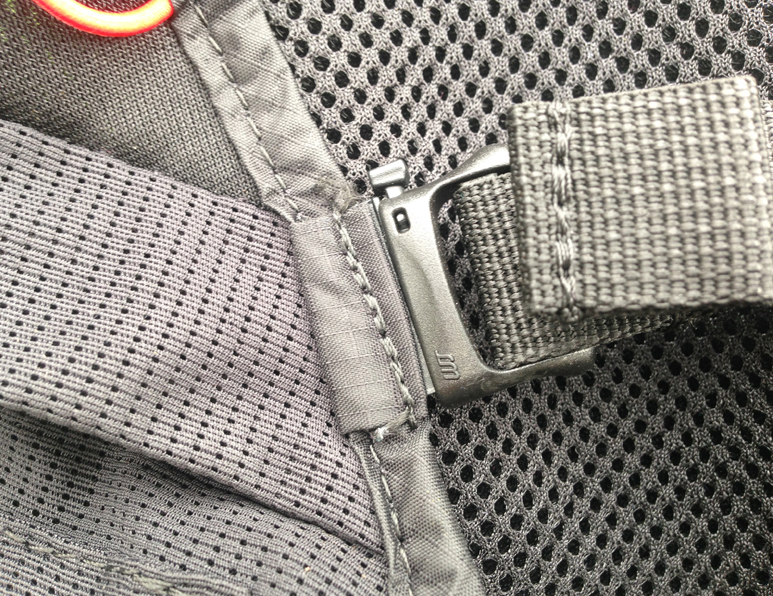 There is an integrated whistle on the front and two straps to secure the vest around your upper torso. There is a bungee cord across the back allowing you to stuff an item on top of the mesh pocket such as a jacket or midlayer. The vest is comfortable and the straps (two front and two on each side) can be adjusted according to your own comfort although the front straps cannot be moved up or down at all but there is a third clip on either side if you wish to cross the straps or use a higher or lower one. You should ensure the bottles are positioned across your body to avoid the swing of your arms rubbing across them but the straps can be adjusted according to your own preferences. The vest is lightweight and comfortable, sits close to the body and has no swing. The bottles are easy to hook off and all of the pockets (except for the rear ones) are easily accessible and provide plenty of options to carry a phone, gels, snacks etc. The Race Vest is perfect for use during a long training run or Ultra (if you can fit the mandatory kit within it) and the weight is negligible. My only negative is the clips which at first I found to be incredibly fiddly. Rather than a male/female clip the vest has a top down pin clip. The pins should be pulled back and clip then pulled down to release. These have been loosened after use and I’m now comfortable with them but during a run with wet or cold hands and it can still be fiddly so a minus point for me. 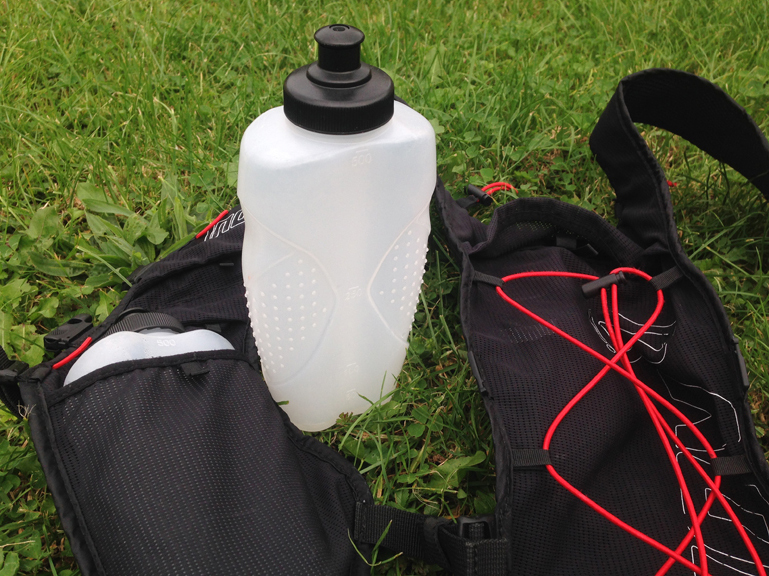 Aside from that, I really like the Race Ultra Vest and am happy to join the crowd of people adopting these as their standard hydration and storage system. My Salomon Slab 12 pack still has its use for events where I need to carry more substantial gear (for example I managed to squeeze all the mandatory kit and 4 days worth of food in it for the T184) but for anything else the Race Ultra Vest will be my preferred choice. Height: 36 cm / 14 in. Just got my race vest and find the bottle sit to the side of the body as I have a largish chest. I see yours sit in a similar position. Have you found they get in the way of your arm swing? I’ll be trying it out later, but tempted to just use the bladder and use the front pockets for storage.